This is a silly question, so I think this is just the place to ask it! I've lived in upper floor condos for almost all my adult life, so I never wondered about this. Thre was just one way to enter and exit: the front door. But now I live in a ranch condo that has two (count 'em! Two!!!!) ways to enter and exit: the front door and garage. All my neighbors never ever use the front door. Much of this is because when they go out, it's almost always in their cars (this is fodder for another thread---their driving twenty feet to the clubhouse instead of walking), so they use the garage. But even if they are just running out to check the mail, it's always through the garage. We visited with one yesterday and started to walk towards the front door to leave and she said "Don't you want to leave through the garage?" and ushered us towards it, even though the garage door was closed and had to be opened for us to leave. The condo is 1700 square feet, one level, so as you can imagine, there isn't much walking difference between going out the front or the garage. And they are nice and new (a year old) but not such showplaces with incredible carpet, wood, or tile that people have to try to preserve it. Have always used all doors (2 or 3 as the case may be) depending on what it is I was going outside (or inside) for. Seems dumb to purposely go through the garage if one is intending to walk down the street. we have a mud room off the garage for our shoes..especially important in winter here in Minnesota...how many people here go barefoot in the house...that's the way its done here..considered impolite to wear shoes at someone's house..take em off at the door landing...so you need to make sure you have on a good pair of clean socks! Are they opening the overhead garage door? It seems to me those have a finite life. Just watch how the chain jerks or the drive turns, and you can see that with heavy use it'll probably break down earlier. I only open the garage when I'm taking out my car or need to pull something like the lawnmower out. Otherwise, it's the front door. If they're using a side garage door, the whole thing about a mud room off the garage may make sense, especially with kids. I can remember having to walk around the back and coming in through the screened porch in one house as a kid. I don't have a regular walk-in door for my garage and I like the more pleasant entry through the front anyway. Yeah, driving 200 feet annoys me too. People are amazed that I'll walk a mile up to DD's school for events in all but the worst weather, when some of them live closer. I like avoiding the parking hassles and half my work is across a park. Oh, and we have covenants about leaving your garage door open. They don't seem to be too enforced, but I don't want to lose my golf clubs or worry about locking my car. I'd probably forget to close it some nights so I just close it whenever I pull my car in and know I won't be going back out soon. You guys actually have room in your garage to park your car? I'm in awe. I've lived in several homes where we almost always went through the garage, seldom through the front door. We are garage people. I can park my car in my side of the garage. My wife's equipment is on her side. Angels danced on the day that you were born. We almost never use the front door and havent in our last two houses, but we used it a lot in the house before that. About the only thing I can think of is that the garage door on our last two houses was a lot closer to the street but the one before that the front door was. In our last house, one of the neighbors left me a bag of peaches from his tree on my front doorstep. By the time I found them about 2 weeks later (in >100 degree heat) there wasnt much left. Yummy. Mostly the garage, but we use both. Depends on what direction and activity we planning. When both cars are in the garage it is a tight fit to get through. tangomonster, you may just have to ask. I'm curious to hear the answer myself. We use which ever door is closest to our intended destination. But until I was in HS, us kids were never allowed to use the front door unless we were going somewhere with our parents, or returning with them. 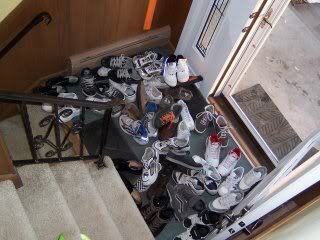 The house rule was that the front door was for adult use only. No idea why. My grandparents and other relatives all primarily used their front doors for everyone, and back door was normally only used by them to go into the garage or to go to the backyard. We almost always use the garage door, either to go in or out, walking or driving. It doesn't make sense to me given the wear and tear on the automatic garage door opener, but I guess replacing the coils every 5-7 isn't really such a big deal. The garage door for moving the car in or out, for taking out trash/recycles, for moving rinse water from washing machine to plants, & (for really bad weather. because of no steps and a large doorway) going across street to mailbox. Other doors depending on destination. either way you go is steps, so it stinks either way! The garage door is for family, friends, & neighborhood kids. The front door is for salesmen and proselytizers (I know, redundant). Geez with this layout they are only about 9 feet apart, Got two use em both. I always use the front door, my wife always uses the garage door. I don't get it... To get out she has to open 2 doors (the door from the kitchen to the garage plus the garage door), and then she leaves the garage door opened all day. It drives me nuts. The other night we went to bed while the garage door remained opened all night. Anyone could have walked in from the street and stolen all my tools... I think the reason I use the front door is because I grew up in a condo and the front door was the only way in. Plus the coat and shoe closet is right next to the front door. I would never ask anyone I invite to my home to use the garage door, be it a plumber. 44 years old. Exited the job market in 2010 (age 36). Have lived solely off my investments since 2015 (age 41). I've never lived in a suburban house, so even the question is puzzling to me. The house, and presumably its doors, is for people and pets. The garage is for motor vehicles and bicycles. So I would just do a self test- am I a person or a motor vehicle? If I am a person on foot I would use a door-- front or rear or side door. If I planned to drive somewhere which I generally try not to, I would use the garage door if I had a garage door. I can see that in snowy or wet or muddy climates the garage could function as a giant mudroom, which might make it easier to keep the house clean.